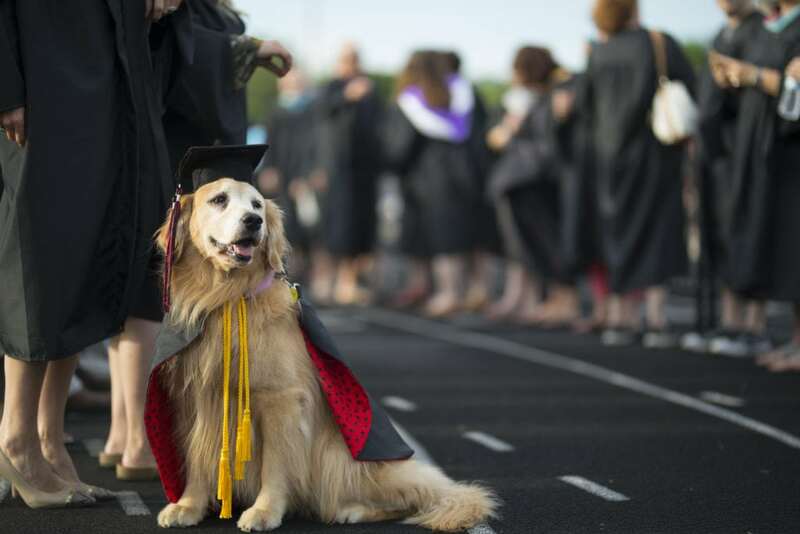 View a gallery of images from the 2018 Lawrence High School Commencement ceremony. 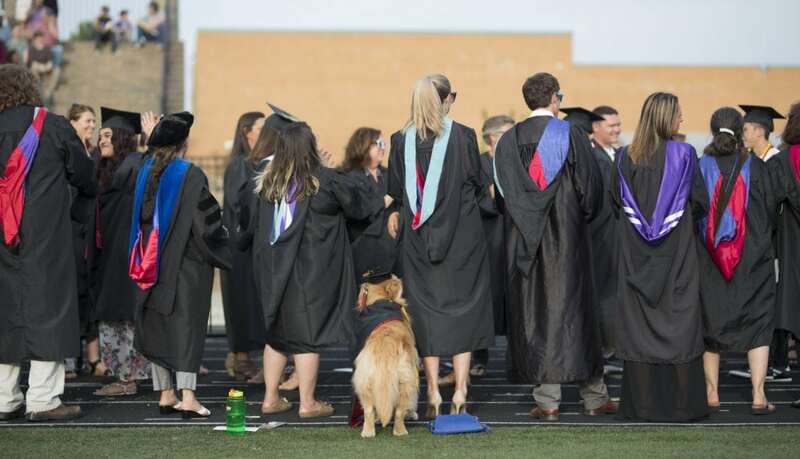 Lawrence High therapy dog Roxy waits for the graduates in her custom-made cap and gown during the 2018 commencement ceremony on Wednesday, May 23, 2018 at LHS. 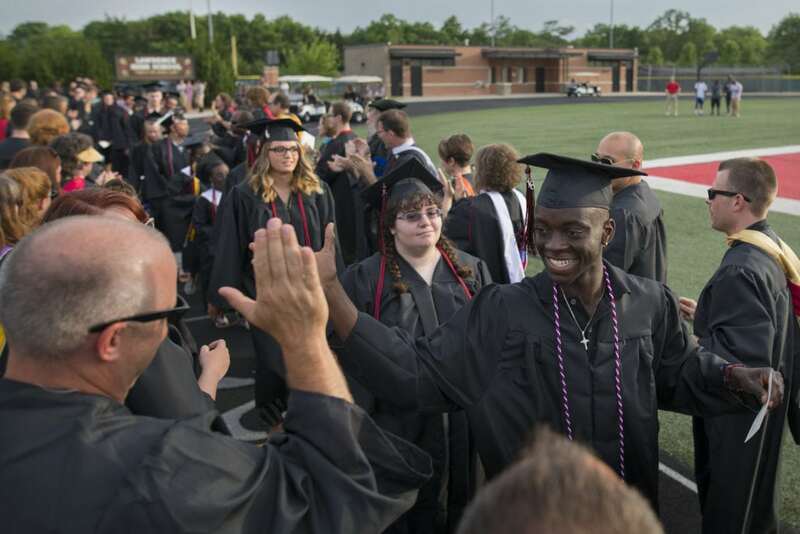 Lawrence High graduate Ekow Boye-Doe high fives head baseball coach Brad Stoll as he and his fellow graduating seniors make their way through a gauntlet of well-wishing faculty members during the 2018 commencement ceremony on Wednesday, May 23, 2018 at LHS. 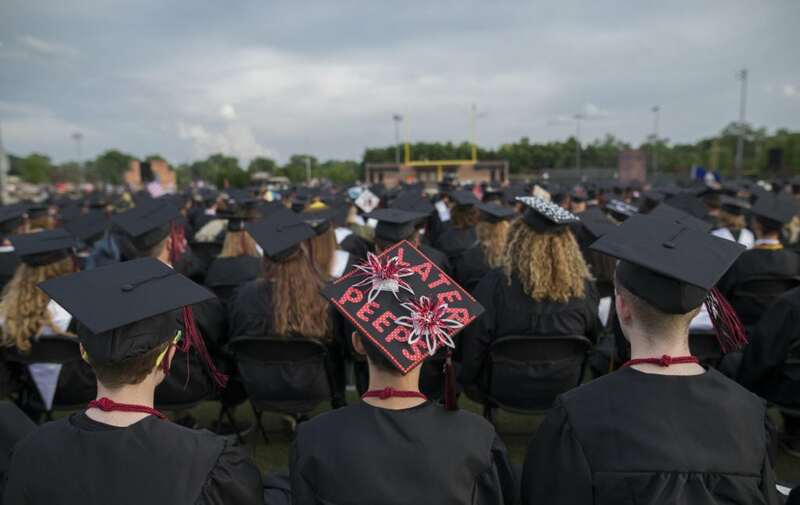 A Lawrence High graduate bids farewell to his fellow graduates as noted on top of his cap. 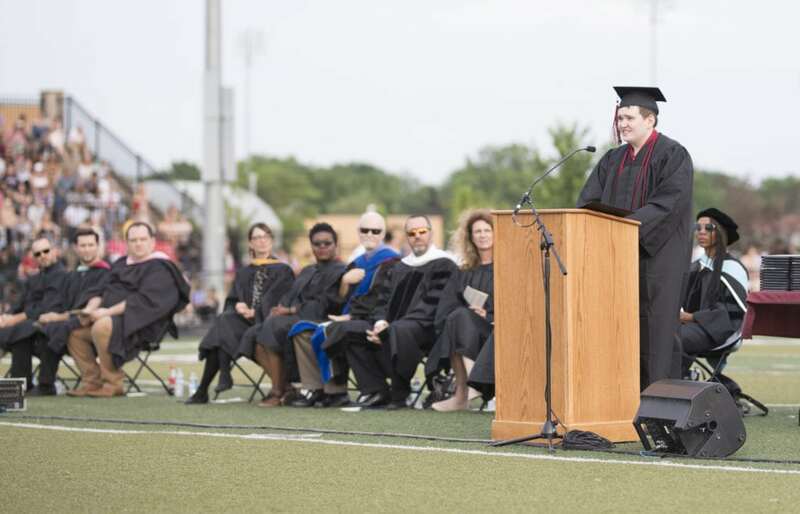 Brandon Lawrenz, a Lawrence High graduating senior with autism, delivers his senior speech, "Celebrating Weakness" during the 2018 commencement ceremony on Wednesday, May 23, 2018 at LHS. 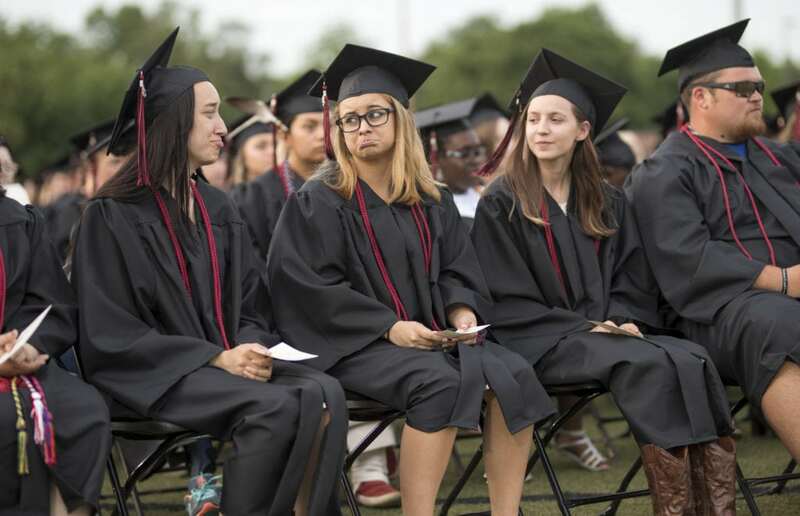 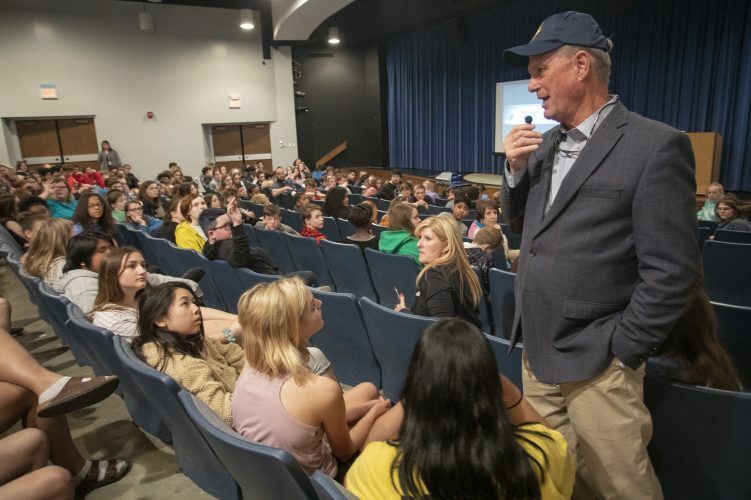 A couple of Lawrence High graduating seniors react to a heartfelt speech, "Celebrating Weakness" by fellow graduate Brandon Lawrenz, who has autism, during the 2018 commencement ceremony on Wednesday, May 23, 2018 at LHS. 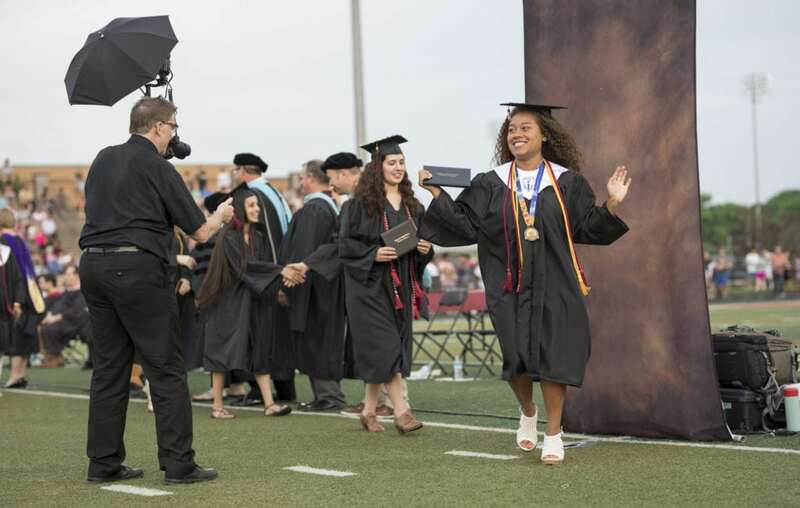 Lawrence High graduate Taeghan Sharpe smiles as she hurries away from a backdrop after getting a picture with her diploma during the 2018 commencement ceremony on Wednesday, May 23, 2018 at LHS. 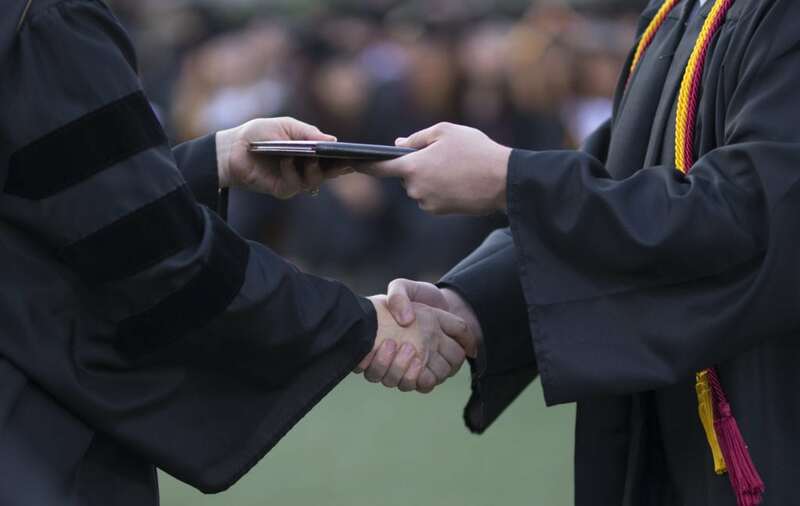 A Lawrence High graduate is handed his diploma from school board president Shannon Kimball during the 2018 commencement ceremony on Wednesday, May 23, 2018 at LHS. 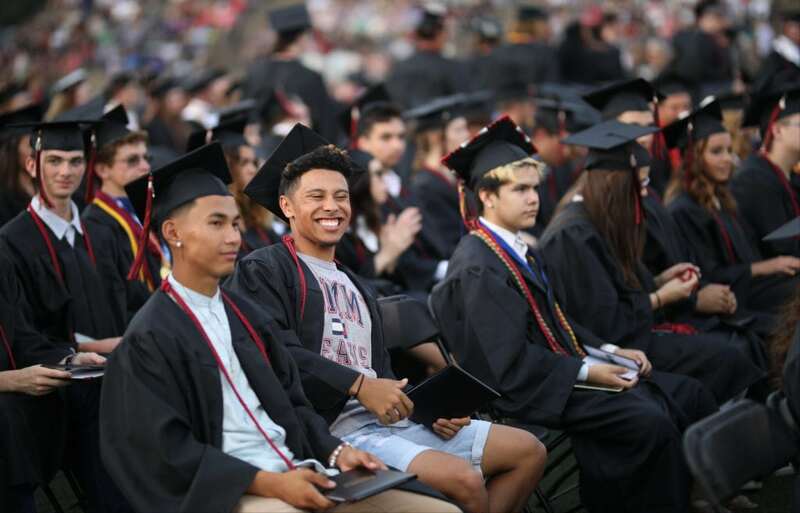 Lawrence High graduating senior Dante Jackson casts a wide smile at a friend as the diplomas are handed out during the 2018 commencement ceremony on Wednesday, May 23, 2018 at LHS. 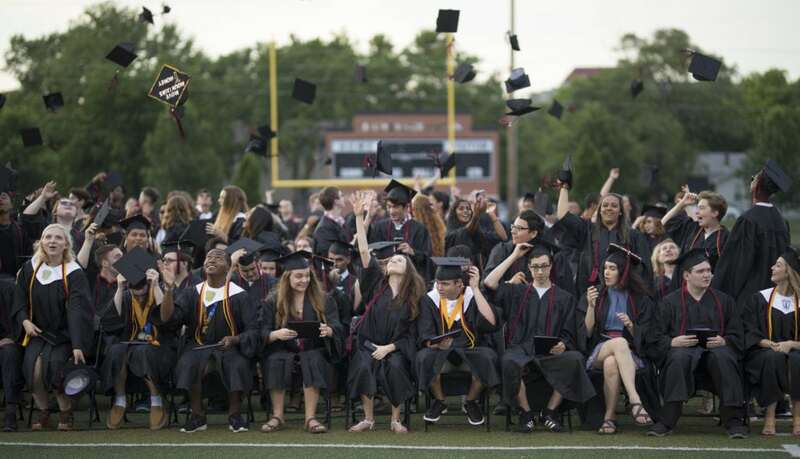 The Lawrence High graduating class of 2018 tosses their caps in the air in celebration at the close of the commencement ceremony on Wednesday, May 23, 2018 at LHS. 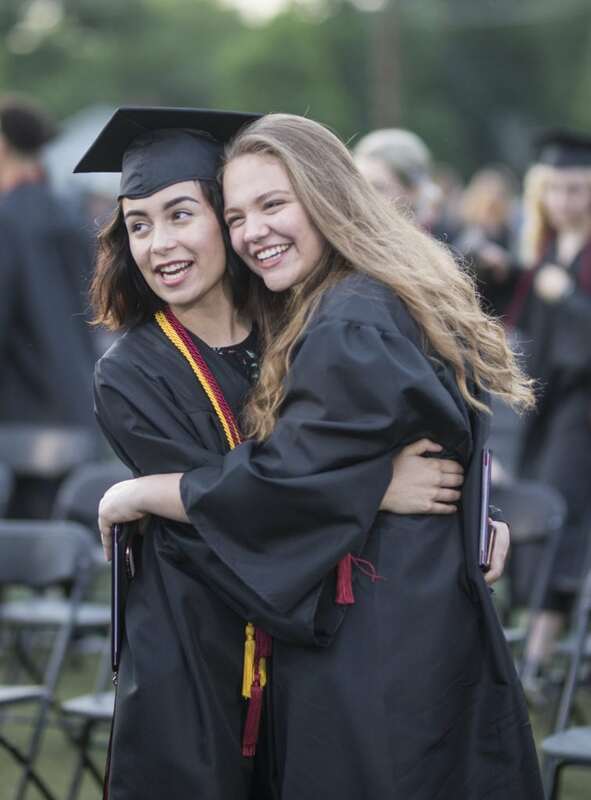 Two Lawrence High graduates hug in celebration following the 2018 commencement ceremony on Wednesday, May 23, 2018 at LHS. 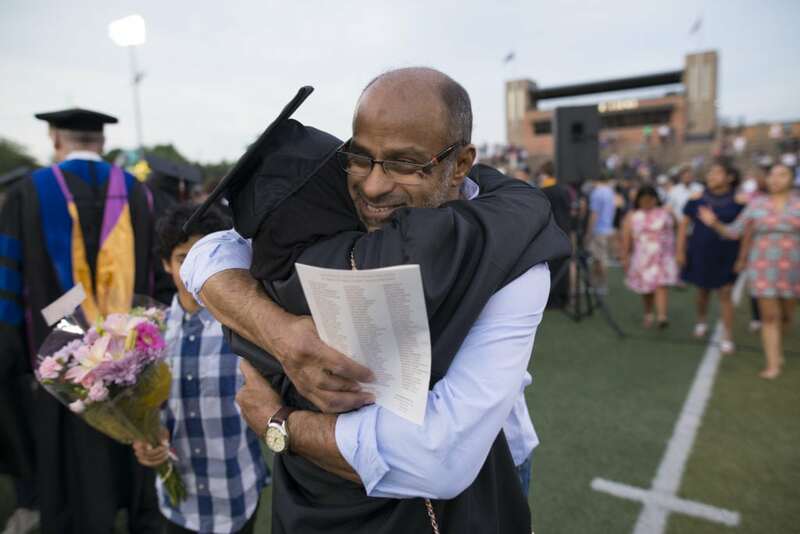 Lawrence High graduate Ghadeer Almohsen gets a hug from her father Tawfiq Almohsen following the 2018 commencement ceremony on Wednesday, May 23, 2018 at LHS. 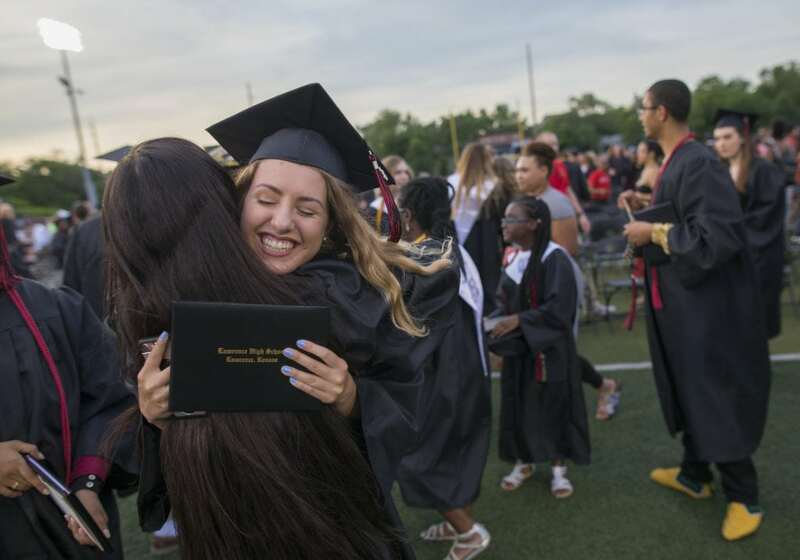 Lawrence High graduate Mia Talley, facing, gives a hug to Kazeo Abdulqader following the 2018 commencement ceremony on Wednesday, May 23, 2018 at LHS.